The Baddest, Crudest, Santa is F**king Back…Kind of. 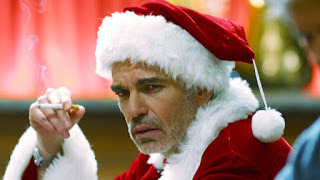 Bad Santa is an enjoyable, raunchy time around the holiday season in the Chase household. I am kidding; it’s just a decent sized apartment. I was looking forward to the sequel, probably the only one, and I was ok with it. Let’s get reel and break this down. …the majority of it wasn’t. I would say the comedy was a 70/30 split hit and miss with miss being the ladder. The story itself fits the crazy, dark atmosphere you would expect from a sequel. The characters are as if they never left the roles thirteen years ago. The new comers are fine and bleed into the background with little to no dialogue or character with the exception of Kathy Bates. While not finding her completely funny, I imagine what Willie’s mom was like and I think she nailed it. Another big issue is Thurman Murman, you know, the little kid from the first; he is all grown up here and it feels a bit more cartoonish and awkward than cute and charming. The heart of the film appears too late in this one unlike the first one where it was a good balance. Say what you want about the comedy, everyone does give 100%. Billy Bob Thornton is crass, crude, and just the way you like your bad Santa. Tony Cox is always great as the loveable elf and Kathy Bates is great as the grizzled mother. The side characters aren’t particularly funny or convincing but then again…this is Bad Santa 2 and the Godfather 2. There was one cool overhead shot towards the end climax. Another big offender is that everything looked like a cheap set and you can definitely tell. The soft lighting and basic set design and art direction sticks out. At an hour and a half, it isn’t too painful and you can find some enjoyment and entertainment about it. As a fan of the first, I was disappointed but the audience I saw it with loved it so there are some people out there that will find some raunchy enjoyment this thanksgiving break.